Alexander Hamilton and Thomas Jefferson laid the foundations for today's political debates between Democrats and Republicans. Hamilton believed that freedom must be married with a strong central government and especially an energetic president, while Jefferson believed freedom derived from local civic virtues. Throughout history, Democrats and Republicans have chosen sides in this eternal debate—and sometimes even changed sides. Today, those debates have become sharper and more polarized, as the two parties square off on major issues such as healthcare, taxes, regulation, the role of the federal government, and what discretion should be given to local authorities. The debate can be loud and shrill, even as the public yearns for some accommodation between these two schools of thought. People may generally desire an active government to deal with acute problems, but localism still has widespread appeal, and political dysfunction often results when these outcomes are presented as polar opposites and elections are reduced to zero sum contests. Social media adds to the polarization, as Americans gravitate to websites that often ratify their preexisting points of view. The parties struggle to function in this environment as they try to adapt to the political realities of the social media age and the Trump era. John Kenneth White is Professor of Politics at the Catholic University of America. His most recent book is What Happened to the Republican Party? : And What It Means for American Presidential Politics. Matthew R. Kerbel is Professor and Chair of Political Science at Villanova University. His most recent book is Next Generation Netroots: Realignment and the Rise of the Internet Left. Super PACs, mega-donors, grassroots activists fueled by social media, a Twitter-crazed president, and alternative facts. Where are the political parties in this unstable and occasionally toxic mixture? John Kenneth White and Matthew R. Kerbel give us an excellent analysis and keen insight into today’s national political parties. This new edition of their important book is highly recommended. In this excellent new edition of their book, White and Kerbel once again demonstrate that change can only be appreciated and understood in the context of what has come before. In the era of Donald Trump and social media, Democrats and Republicans both face a myriad of new challenges. The authors present historical context to establish convincingly that, in many ways, we’ve been here before and the parties have managed to adapt. In spite of all the new challenges, they remain optimistic that the parties – and the democracy they serve – can and will weather the current storms. 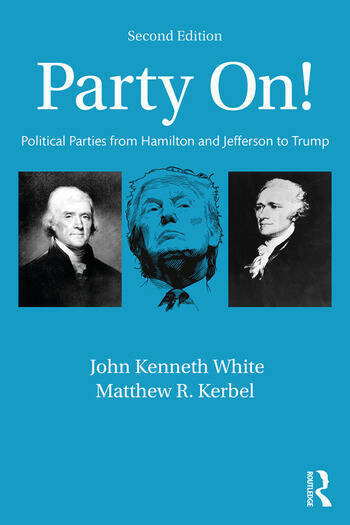 This new edition by White and Kerbel is an expert effort to explain the bewildering changes in party politics in the age of Trump. As – or if – we recover our bearings, we will gain much from their historical and empirical pathways through America's new and unexplored terrain.